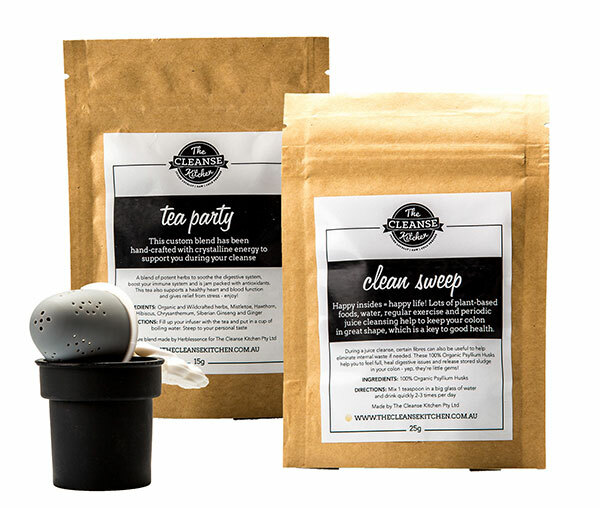 Get a free tea infuser when you purchase the Tea Party & Clean Sweep pack. This custom blend has been hand-crafted with crystalline energy to support you during your cleanse. Tea Party is a blend of potent herbs to soothe the digestive system, boost your immune system ad is jam packed with antioxidants. This tea also supports a healthy heart and blood function, as well as giving relief from stress. Ingredients: Organic and Wildcrafted herbs, Mistletoe, Hawthorn, Hibiscus, Chrysanthemum, Siberian Ginseng and Ginger. Directions: Fill up infuser with the tea and put in a cup of boiling water. Steep to your personal taste. Happy insides = happy life. Lots of plant-based foods, water, regular exersize and periodic juice cleansing all help to keep your colon in great shape, which is key to good health. During a juice cleanse, certain fibres can also be useful to help eliminate internal waste if needed. These 100% Organic Psyllium Husks help you to feel full, heal digestive issues and release stored sludge in your colon – yep, they’re little gems!